Prof. Jim Kolata has always had an appreciation for the many ways in which the subfields of physics intersect, nowhere more so than in the field of cosmology. Though an experimental nuclear physicist and a long-time leader in Notre Dame’s radioactive beam program, Kolata developed in 1989 a course in elementary cosmology aimed at curious students wanting to understand the current developments in that rapidly advancing field. That course is today a stalwart of the Notre Dame Physics Department’s curriculum, taught to nearly 200 students a year. Kolata has now brought together his notes and insights from teaching that course, combined with the latest news from the field, and published a textbook on the subject. Entitled "Elementary Cosmology: From Aristotle’s Universe to the Big Bang and Beyond” and published by the Institute of Physics, the book begins with an introduction to the concept of the scientific method. 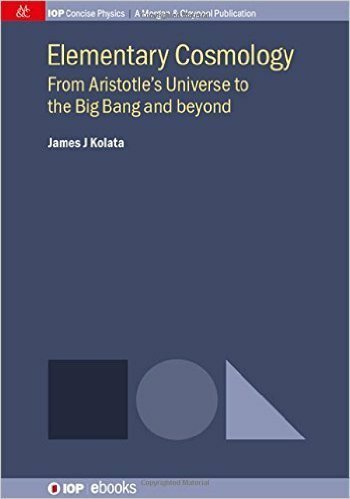 It then describes the way in which detailed observations of the Universe, first with the naked eye and later with increasingly complex modern instruments, ultimately led to the development of the “Big Bang” theory. Finally, the book traces the evolution of the Big Bang including the very recent observation that the expansion of the Universe is itself accelerating with time.